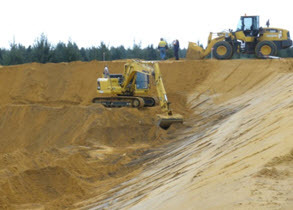 “In August of 2011 we constructed a second holding dam for irrigation water. This was needed to get more Iron out of our irrigation water. In the design of the dam we incorporated a cascade for the aeration of the water on one of the dam walls. The earth works of this dam were somewhat complicated due to the fact that the construction was adjoined to the existing dam and a cascade system was to be placed on the dam wall. For this work I approached Limestone Park Earth moving. They are great. Just simple things as arriving at the time that was agreed and coming on site in advance to oversee the job and work the job out in to detail. When the machinery was on site with the staff from Limestone Park the job got on its way pretty quick. Regardless of how big or small the machine is, it is the operator that makes it work! The people we had are very skilled. This resulted in a great job very tidy and correct. ''APB Modular engaged Limestone Park to carry out the earthworks on a recent project in the Mid-West. This project was very successful with all involved receiving great praise from the Client. Since that time we have re-engaged Limestone Park on a second project and continue to present works for pricing by Limestone Park. To date we are extremely impressed with the quality of work on both projects and will continue to work with Limestone Park moving forward. Limestone Park and Mike Agnew have assisted our Breton Bay Group with all stages of the subdivision of our rural property at Breton Bay in the Gingin Shire. “I have recently purchased a virgin block of land and Limestone Park cleared 1ha of it, put down the driveway, created three sand pads, sculptured the block, installed the septic tank and delivered sand for the brick walls.